Early this fall I had a call from Shirley Schadle. She now lives with her husband in Grand Rapids, MI, but she grew up in Zambia, Africa. Her dad was a veterinarian there, so Shirley had a chance to look for agates near Victoria Falls as well as along the Luangwa River. She visited my booth at both the Mason and East Grand Rapids shows. When I saw the Zambia agates, I was struck by three things. First of all, many of them looked just like Lake Superior agates. I have said that before about some of the agates from Botswana, China, and Mexico – but this time the similarities are even more pronounced. Second, there were a couple of the agates that look a lot like Botswana agates with pinks and grays. When I did some research to find out more about the genesis of Zambia agates, I found out that they formed in basalt pockets from plumes of hot magma that erupted to the surface of southern Africa between 177 and 185 million years ago. This type of plume is considered by geologists to be a “large igneous province” since it spread lava over an area more than 38,610 square miles in a short geologic period. What is interesting is that this same plume produced both Zambia and Botswana agates. Third, I noticed that some of the agates appear to be polished. When I asked Shirley if she tumbled them, she emphatically said that she had not. Apparently there was diamond dust that naturally occurred in the river. As the agate nodules tumbled down the river carried by the currents, some of them were naturally polished by this diamond sand. The next contribution to this web page update includes agates found by Lee Dane from Vanderbilt, MI. 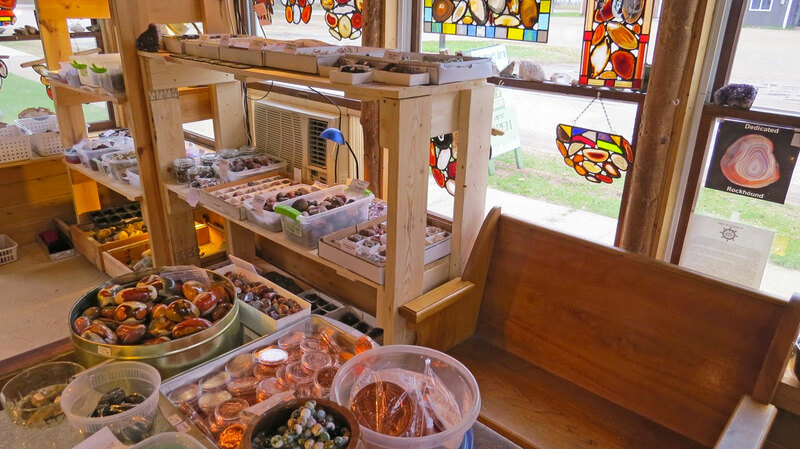 She goes agate hunting every chance she gets, most of the time between Crisp Point and Vermillion Beach, located on the southeastern shore of Lake Superior. Lee showed me the agates during a busy art show, but I was able to snap off a few pictures.